New for summer 2019, we are delighted to welcome you to Soul Miranda, situated in lovely Santa Ponsa, Mallorca. Popular with holidaymakers for more than 40 years, Santa Ponsa is a friendly resort, with a large blue-flag sandy beach, rocky coves and a wealth of shops, bars, cafes and restaurants. Exclusive to Solos, the hotel invites you to spend your day amongst newfound friends in a cosy and sociable atmosphere, where the hotel staff and our Tour Leader are always on hand. There is a private pool for those wishing to spend their day enjoying the sun and there’s also a bar at the property to keep you refreshed. Soul Miranda gives you a comfortable base in a fantastic location. Our friendly property is situated in a quiet area of the resort, just a level 300m walk from the main sandy beach and resort centre with its numerous shops, bars, cafes and restaurants. To take full advantage of the array of excellent cuisine available in Santa Ponsa, the Soul Miranda is offered on a bed and breakfast basis giving you the opportunity to explore and sample the many excellent restaurants and cafes on offer nearby. Looking for a more active holiday? We also have a brand new walking holiday based at Soul Miranda. For more information, click here. Attracting a wide range of visitors, the resort has a cosmopolitan vibe that offers a great choice of international cuisine. The promenade by the main sandy beach is edged with pine trees, where you can seek out the shade and even watch the cute parakeets. The rocky shoreline either side of the sandy beach has many cliff paths and rocky coves that are perfect for exploring. The Calle Ramon de Montcada has a large array of music bars, clubs, discos and restaurants which after dark become quite lively. There are also a selection of quieter bars and places to eat if you want a quieter evening, and live music can be found at several venues. This lovely resort really has something for everyone! There are a wide range of boutiques and gift shops in Santa Ponsa, in addition to a Saturday market and plenty of quirky street vendors. Palma is only 30 minutes away by bus; the stop is only a few minutes' walk from the property and the cost only a few Euros. In Palma you can enjoy the authentic atmosphere of a vibrant Spanish City, enjoy shopping in a wider range of shops and boutiques or visit Palma Cathedral. On the hill overlooking the seafront, its Gothic architecture is accentuated by its beautiful stained glass windows, creating a warm, colourful glow when inside the building. 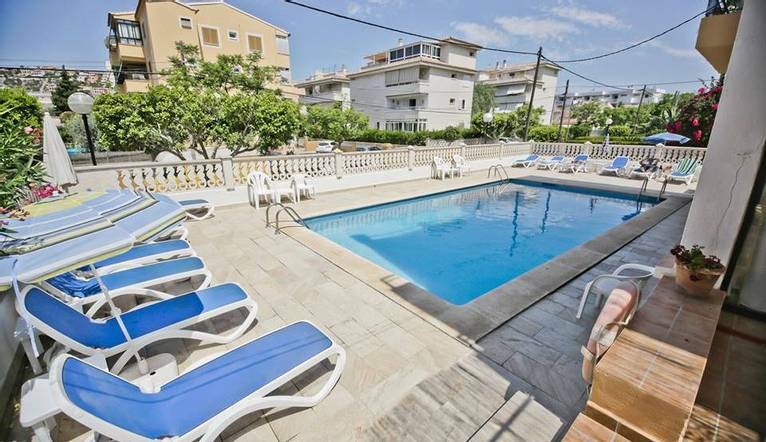 Our small, friendly property is located in a quiet street set back from the main resort centre of Santa Ponsa, where we can take advantage of the array of bars and restaurants on offer. Facilities include a swimming pool with loungers and umbrellas, breakfast room, bar with TV and pool table and free WiFi throughout the property. Our comfortable rooms feature air conditioning, satellite TV, safety deposit box (payable locally) and all rooms come with a furnished balcony. Prices are based on twin rooms for sole use however we have a small number of single rooms offered at a discount. Soul Miranda Suites does not have a lift and is therefore not ideal for people with walking difficulties. Any excursions bookable in resort are subject to availability. Call or see the website for regional flight details. Transfer time from Palma airport to the Soul Miranda is approximately 30 minutes. You may wish to take an optional excursion during the course of your stay. Full details will be given at the Information Meeting. The prices quoted, are a guideline only, as these can vary, depending on numbers and local conditions. All tours should be paid for in euros. Credit cards are not accepted. The exact amount will be given at your Information Meeting. Your Tour Leader will help arrange these for you but may not necessarily accompany you. This tour takes us to the east coast of Majorca, to the charming little fishing village of Porto Cristo. Here the caves of Drach are situated, which contain some wonderful rock formations, all cleverly illuminated, and the largest underground lake in the world. A concert is played from little boats on the lake. This trip also includes a tour of the Mallorca Pearl Factory. There is time for shopping and sightseeing in Porto Cristo.